Today was bath day for B and C. It is only the second time we’ve bathed Coby at home. He’s also had two baths at the groomer. At home, the boys gets their baths in the kitchen sink since they are small enough and it’s easy on our backs. Coby’s very first bath took place at home, and I tried to give him it by myself. He was so scared he crawled up the front of me. I soaped him up while holding him, then put him back in the sink to give him a quick rinse. So today, I gave Buddy his bath and Dave held Coby so he could watch how it’s done. Buddy is soooo good during his bath. He stands in the sink without much movement of any kind. After he was done, it was time for Coby’s bath. It took both Dave and I to hold him in the sink as he was squirming all over and trying to climb out. With some effort, we got him soaped up and rinsed. The excitement happens after the baths. We towel dry the dogs as much as possible, then they rub their ears all over the floor to dry them – they hate wet ears! Seeing this is quite the sight! There is normally a lot of chasing and playing that goes on after bath time too. Almost as if the dogs are excited to be clean! 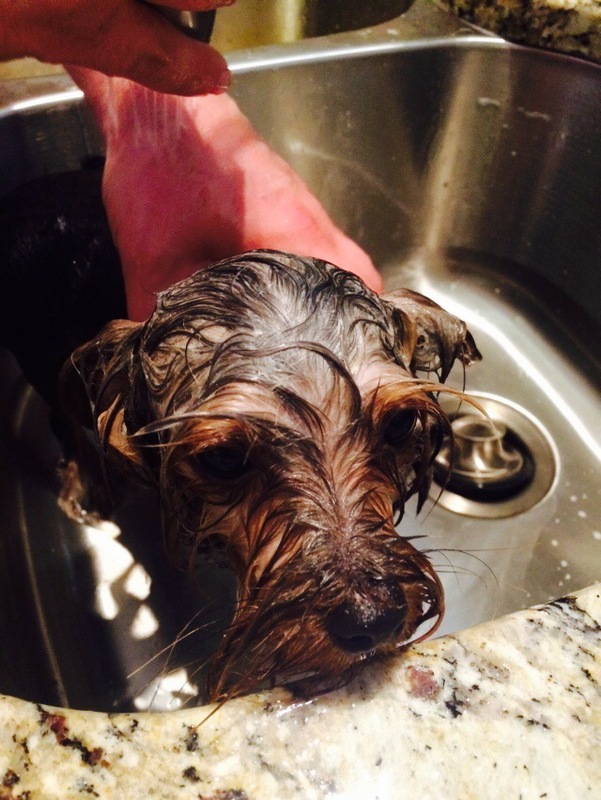 Check out the videos and pics of bath time at the Dean’s. Coby after being bathed and brushed. Thank you!! I was having difficulty adding them. They are there now. lol. Cute puppies. Hopefully they will get used to their baths! My Silky, while he doesn’t love getting a bath, he becomes very submissive. It’s actually really cute!!! I wait to summer to give Izzy a bath. It’s a nightmare trying to give a big dog a bath. It’s more of less I get a hairy dirt bath. Sophie we just stick in the sink. I love how happy they are afterwards. Coby feels so soft and lovable today!!! aww. There is nothing cuter than a dog getting a bath. Which reminds me, mine is due for a good spring cleaning. Spring cleaning – I like that! They look so sad when they are all wet dog, lol!